No, this post is not about plastic surgery or hydrogel injections to enhance one's backside. It's not about how many bullet holes are in this sign, either. Fuller Bottom was the trailhead for Saturday's 18 mile round trip horseback ride along the San Rafael River. Daisy was in heaven. A trek with flowing water is her favorite thing. She led the way at the many (about 10) river crossings. The crossings were shallow and easy at 20 cfs. Adventurers canoe this river during the spring run-off when flows are above 100 cfs. Sandstone cliffs, cottonwood trees dressed in new green leaves, and the clear San Rafael water made for beautiful views. Most of the trail was sandy, but there were a few challenging rocky spots where the horses had an opportunity to practice their climbing skills. Doesn't Coco remind you of a grasshopper in the above photo? Our destination was Virgin Spring Canyon, where we hoped to find rock art. Can you see the pictographs above Boss's head? They're perhaps 20 feet off the ground, and no more than 2 feet tall. The details are mysterious and fascinating. Are those gossamer wings coming from the figure on the left? What do the symbols above their heads mean? Could they be offering something to Father Sky, in hopes of some divine intervention on a deer hunt? 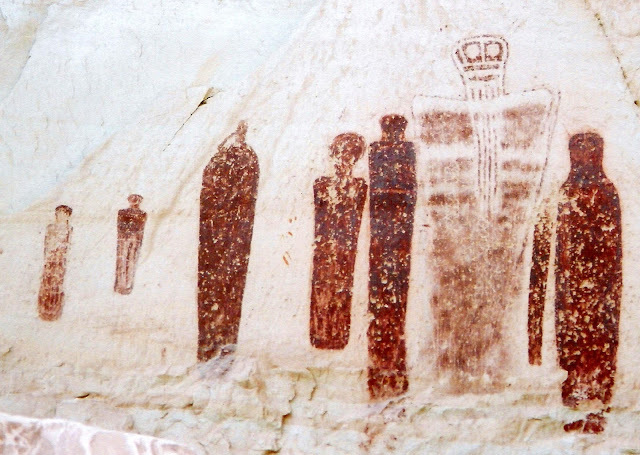 In the panel above, the figures may be holding weapons. Are those spears, or atlatls? The painting has chipped off on the bottom. It's sad to think that these panels may not be here in another generation or two. This one has already faded with time. Could the figure to the right be a flying turkey? That would be appropriate. We saw a turkey fly out of a grove of trees along our way. We also visited Virgin Spring, featuring a beautiful pool beneath a sandstone pour-off. This ride is in the San Rafael Swell. We haven't explored the area very much so far, but it has so much to offer that I'm sure we'll be back. On another ride, we follow the Bad Man Trail. Various outlaws who lived in the region used this trail when trying to escape possees. Steve and Boss stand in front of a path worn into the sandstone. A lot of bad men and tough-as-hornytoad horses and cattle must have traveled here over the years. The desert is in bloom. The yellow flower above is showy stoneseed. The bees are busy. This one collects pollen from a wallflower. This phlox grows in a rounded shape, rooted in a mound of sand that it holds safe from wind and erosion. A pale evening primrose shares space with prickly pear cactus. Water is scarce, but plants have deep roots. Deciduous trees mark possible water sources. Wily animals and humans know where to find pools to sustain them. Last week, we drove down to the San Rafael Desert just outside of Canyonlands, Maze District, for 3 days of riding. In contrast to the snow we found on Lake Mountain in the previous post, temperatures were near 80 F on the red desert. The first day, we started at Kegg Knoll and rode toward the arch you can see on the cliffs above Steve and Boss. In the hills below it, we searched for Old Man Spring, where someone purportedly ran a still in Prohibition days. We found this cave and a few cottonwood trees. The sand was wet, but we didn't find any actual water. Springs in this area surface at the contact zone between the permeable Entrada and the Carmel layers of sandstone, which is what we found here. Grass and other vegetation were greening. The yellow blossoms of a Fremont's Mahonia brightened the scenery. Maybe the Old Man used up all the water making whiskey! We rode up to the top of Lake Mountain in mid-April. The first part of our trail was over hills with a few patches of snow remaining. Coco and Daisy enjoyed the sun. Between them, Marsh Peak rises in the background. and a dozen or so elk. They were retreating over the hill by the time we got the camera in gear. As we approached the 9000 ft summit, we trudged along a snowy forest trail. Mischief and Daisy wanted to participate in Janie's lunch break. Up top, Gull Lake was still frozen. We saw a coyote scamper along the shore. He didn't stay around long enough to have his picture taken. 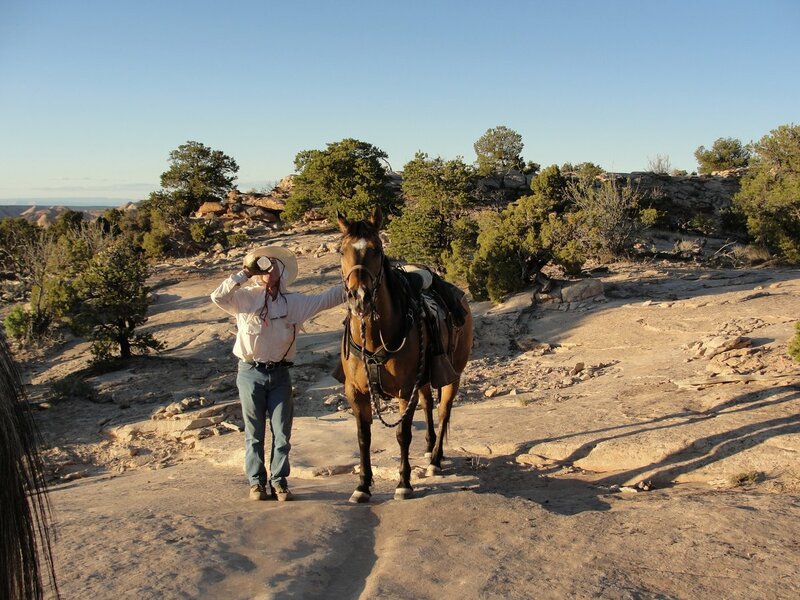 Split Mountain, located in Dinosaur National Monument, makes a great spring ride. The above photo stitch marks the trailhead and the mountaintop. Round trip, it's about 12 miles and 2200 feet altitude gain and loss. The horses had a nice grass break about halfway up. This twin bladderpod (physaria, of the mustard family) camouflaged a butterfly so well that we almost missed it. and a few barrel cactus sported their yellow flowers. A couple of horned lizards scurried through the junipers. We assumed they were a couple contemplating a spring fling. Females are larger than the males in this species. A lot of these pesky critters buzzed around us and sucked a little blood whenever they had a chance. Unfortunately, we weren't expecting flies and didn't spray the horses beforehand. At the top of Split Mountain, we paused to take in the panorama of Green River's path through a deep gorge directly below the peak to its lazy bends in the basin beyond. On the way down, the expansive view encompasses the desert floor, red hills, and the snow-covered Uinta Mountains, about 40 miles away. Daisy report: No dogs allowed in the monument :( And since there was no water on the ride, she couldn't have made the distance anyway. Big sister welcomed the little guy with a kiss. Of course, not being the baby any more is a bit of a disappointment. But this girl knows how to have fun, even with something as simple as a bag of shredded paper. 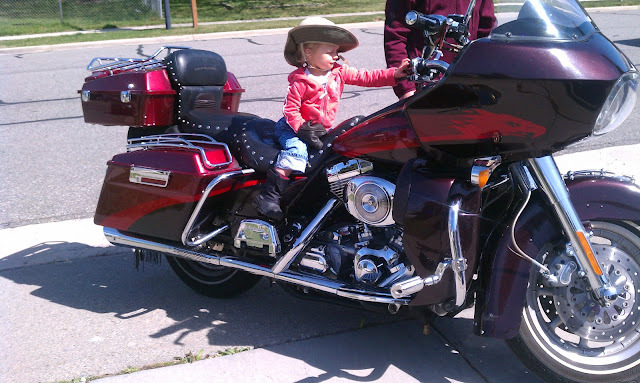 She loves anything with an engine, so she'll have plenty to teach lil' bro' as soon as he's big enough to follow her around.